With deep molded center panels contrasting with the surrounding black molded foam padding, the GTS Elite kayak seat looks like it belongs in a high-end sports car rather than a kayak. It has new, widened rear attachment straps for even more solid positioning which helps prevent seat slippage. On either side of the seat the paddler has the option of micro adjusting their forward lean from four ''easy release'' thumb action tension locks. There are two lower tension lock adjusters for the lumbar area and two upper tension locks for adjustment of the forward lean. Overkill'' Perhaps, but tuning your kayak seat to custom fit your back makes a huge difference in the enjoyment of your paddling. The ergonomically sculpted 18'' tall back portion of the seat offers maximum high back support. The universal detachable pack system is available in all GTS kayak seats and gives you the ability to change out to one of our other four optional storage configurations. We have virtually eliminated that annoying "kayak seat slippage" with our new triangulated 6 point rear attachment design. In this new versatile and infinitely adjustable rear lock down system we pull the rear of the kayak seat from two adjustable upper points- which determines the lean and two adjustable lower points- which combats any forward slippage. This method of counterbalancing the pull points secures the seat back to the boat and provides an extremely supportive and comfortable back plane that allows you to not only customize the position of the seat but makes the kayak seat versatile enough to fit into the broad range of kayaks''. From shallow to deep kayak cockpits we have got you covered. If high end seating is your pleasure than this kayak seat is what you want. 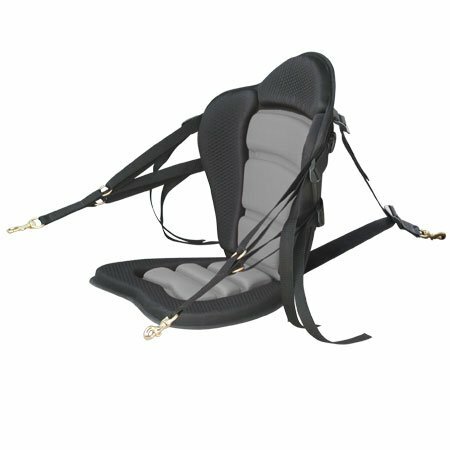 Multi-adjustable front and rear straps solidly lock in seat position. Marine grade solid brass connecting snaps. The ergonomically sculpted 18'' tall back portion of the seat offers maximum high back support.